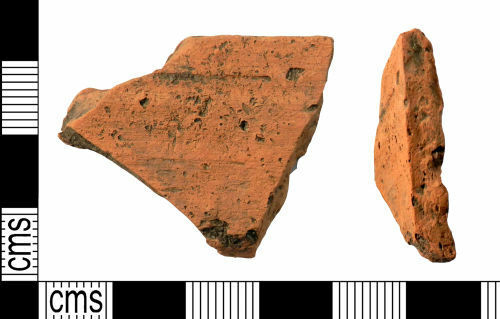 A fragment of a wheel thrown ceramic vessel of Roman date. The fragment has an oxidised buff orange fabric with a hard, smooth/powdery texture and is of a local (unsorced) type. Ovoid voids are present suggesting calcareous inclusions. The fragment is 39.1mm long, 30.6mm wide, 5.6mm thick and weighs 5.6g.